Although Battlestar Galactica has been off the air for a year, and the presidential election we were spoofing is long over, the Adama for President site will remain up until the end of 2010 as a legacy site where you can still buy a few items from the Zazzle store, if you’re so inclined. -The first boost for the non-campaign was this mention in io9.com, where we were unaware the footage would go online and figured WTF, let’s see how long the joke will last. -Thanks to help from our friends at Galactica SitRep, we managed to send a care package to the BSG set in Vancouver, where they were filming the last episodes of the final season in 2008. That was rather funny. -Enough people bought the shirts to pay for my way to Comic Con, where we gave out stickers and free posters to fans waiting for the BSG panel. -Even more awesome, one of our readers climbed 13,000 feet to the summit of a mountain, and carried one of our shirts all the way to the top for this photo. Wow! Talk about dedication to the fake cause! 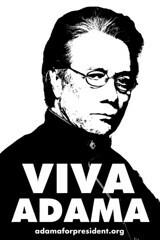 -The coolest moments were when “Admiral Adama” himself made a few mentions of the joke at cons, and was eventually spotted wearing one of the shirts. None of us ever got a chance to meet Eddie in person, but it was rather cool to see him wearing one of our little Zazzle shirts in public. I mean, really? -And finally, I was floored when this showed up on the LA times blog. Someone emailed me that day and noted it (as I don’t read most of the LAT to begin with) and again, I was floored. I mean, this whole thing was a domain name + a Zazzle store, plus a few care packages to the cast and writers and one mention at io9.com, and suddenly, people bought these things? Really? The whole project was a lot of fun, and I made a little side money off of Zazzle (although not as much as you might think since their base cost is high, so the markup was very low.) Still, the total amount of money I spent was maybe $100 bucks total, and the entertainment value of seeing this thing go crazy was kind of fun. That said, I have no idea what the next gag site might be. Caprica doesn’t seem to be the mine of fandom that BSG was, and besides, politics is lame now, on all sides and no one is in the mood for satirical gags. If I could come up with some cool Jack Bauer site or whatever, that’d be cool. Word from one of our supporters is that it’s Katee Sackhoff’s birthday today, and the fine folks at Tcritic are taking suggestions for Best Battlestar Based Tee. Why not post something about your Adama-related clothes and stickers over there? And happy birthday, Starbuck! Seriously. What started as a bar conversation in late 2007 between myself and my brother about a pun evolved into an amazing viral site that was the perfect combo of scifi, faux politics, and fun. Thanks to the kind words of io9.com we launched into the blogosphere, and thanks to the amazing, awesome awesome ProgGrrll and Logan of of Galactica Sitrep, we had an amazing win sending our stuff to the set as they filmed the final episodes of the series. I made enough money to go to Comic-Con, and this whole “grassroots” movement culiminated in the ultimate win of seeing star Eddie James Olmos with our shirt at a con. We even rocked Facebook with our Facebook Application which has an AMAZING 65% acceptance rate and has spread worldwide. The whole experience was a lot of fun, and none of it would have happened without your support. Thank you for a fun year, and enjoy tonight’s finale. For fun, why not download a PDF of the poster and post it one last time, and maybe take a picture and post it to Flickr or Facebook…I’m sure Adm. Adama would approve! The good folks at Zazzle.com have just announced a new discount code in honor of Inauguration Day – $4.40 off any shirt in the Zazzle store! All you need to do is go to our Zazzle store, pick out any shirt for sale (you’ll find both N Judah and Adama for President items there), and enter the code 440SHIRTSALE for your discount. The discount starts today and ends at 11:59pm on January 20th (PDT). As always, awesome fan news can be found at Galactica Sitrep and SciFi Channel’s website. You can also watch the webisodes on Hulu.com or download them in high definition from iTunes! Well the “real” election is over…but the Adama for President site will continue since we still have Season 4.5 of Battlestar Galactica in 2009. We will also keep our Facebook Application and Group running as well. And of course, you can still buy an Adama For President Shirt or sticker in the store. They make great Christmas gifts for your BSG-fan friends and family as well! If you have any ideas or suggestions for what you’d like to see, especially after Season 4.5 gets started, feel free to post a comment here! UPDATE: Zazzle has a 10% off code from November 17th-20th. Simply use the code ZAZZLEPAYPAL when you check out and you get 10% off anything you buy!